And the series is now tied at one game apiece! Here are the memorable happenings that had fans cheering (and jeering). After suffering a 94-90 Game 1 loss to the Colegio de San Juan de Letran Knights (CSJL),the San Beda Red Lions came roaring back in Game 2 with a 68-61 victory last October 27 at the SM MOA Arena. 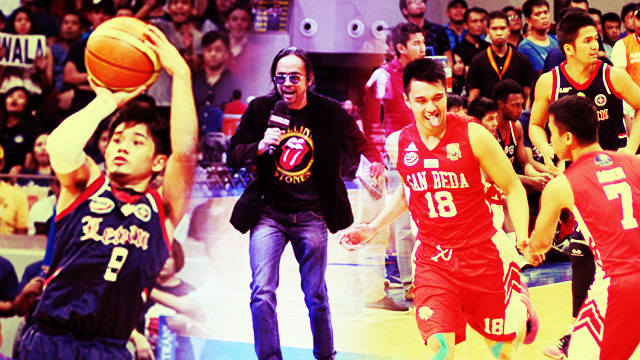 The San Beda win tied the best-of-three series to one game apiece. It also reignited the Mendiola squad's hopes to claim their record-breaking sixth-straight NCAA championship. Knowing that they're in a must-win situation, the Red Lions didn't lose composure in a close game of runs. They gave the Knights headaches as they established an almost impregnable defense throughout the game. Making up for his Game 1 blunder was red shirt senior Ola Adeogun, who finished with a team-high 14 points and eight rebounds. "The Big Red Machine" Art Dela Cruz added 12 markers, six boards, and six assists to help his team get the W.
But it was forward Javee Mocon and talented guard Baser Amer who really came out big for San Beda as the two played their hearts out to secure the Game 2 victory. Mocon was a hero off the bench, delivering a surprise performance of 13 points (11 coming in the second half), eight rebounds, and two blocks. Amer, on the other hand, didn't scorch the basket like he usually does, but his energy was felt throughout the game as he flirted with a double-double with nine points, 11 rebounds, and four assists. Mark "The Antman" Cruz led Letran with 21 points, six boards, and four dimes. However, the defense got the better of him in the latter part of the match, going scoreless in the fourth quarter. The game also got to him and he almost lost himself to an altercation when a fan allegedly threw some nasty words at him in the endgame. The winner-take-all Game 3 is happening tomorrow, 4 p.m. at the SM MOA Arena. Given how the two teams fought during the first two, expect both squads to lay it all on the line and give us another collegiate basketball classic. To get you really stoked, we compiled the best Game 2 highlights (and lowlights) to build up the NCAA finals excitement even more. Think of this as a sign of things to come. Letran Knight Jerrick Balanza Goes Dr. J! During the second quarter of Game 2, CSJL guard Derrick Balanza drove to the basket and found a waiting Adeogun at the rim. He didn't back down though as he pulled off an amazing Dr. J-esque move. The Antman Show (while it lasted). CSJL star Mark Cruz punctured the Red Lions' defense with his pull-up jumpers and isolation plays, making 21 points in just three quarters of play. Too bad San Beda's D clamped down on him in the final canto, where he scored zilch. His one-man offensive show was fun while it lasted though. In the middle of the second quarter, Ryan Rems shared his analysis on who he thinks will win the series. While he did mention that both teams' chances are pretty even, he slightly favored the Red Lions—because of his alleged "sulutan" experience with the boys of San Beda when it comes to girls. Wait, what? Players from both teams fighting for the ball in Game 2 was a sight any hoops fan will appreciate. However, the game got a little too physical at times, with dangerous bumps and nasty spills putting the hurt on both squads. Good thing the refs were able to keep things under control. After losing a hard-fought game, Letran's main man and his frustrations were definitely boiling out of control. And a below-the-belt insult from a heckler is the last thing he wanted to hear in that situation. Fortunately, he was successfully restrained by his teammates before things got out of hand. Chill, Mark! You don't want to be a social media star for the wrong reasons now, do you?